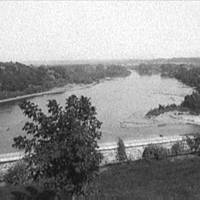 The U.S. bought this land along the Mississippi for 3 cents an acre. How much do you think it's worth today? In the 1800s, in the United States, pioneers and homesteaders eagerly moved west to start a new life in the plains, hills and mountains west of the Mississippi River. This movement could not have happened without the Louisiana Purchase Treaty, approved by the Senate on October 20, 1803, by a vote of 24-to-7. The agreement, which provided for the purchase of the western half of the Mississippi River basin from France at a price of approximately 4 cents per acre, doubled the size of the country.